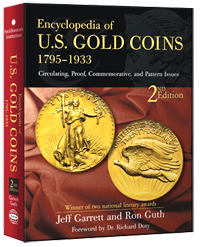 Actual size of book - H 11 1/4" x W 9"
United States Gold Coins have seen a popularity boom in recent years. Thousands of new collectors have discovered their rich and fascinating history and appeal. Important collections, locked away for decades have come to light, and a new research has provided collectors and investors with a wealth of information previously unavailable. There has never been a better time to explore the wonderful field of United States gold coinage-and the Encyclopedia of U.S. Gold Coins 1795-1933 is your passport to that exploration.